As part of Israel’s ongoing struggle against the residents of al-ʿArāgīb, The Southern District Attorney’s Office filed a contempt of court lawsuit requiring to impose a 5,000 NIS fine per day on ten of the village’s residents, starting from February this year. This is yet another step in the state’s ongoing attempts to force the residents out of their land. 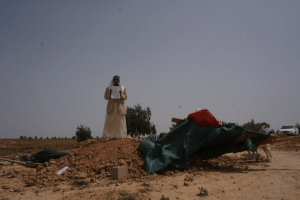 Photo: Sheikh Sayyah al-Turi stands on the ruins of the village and holds the lawsuit filed against its residents, 20 April 2015.